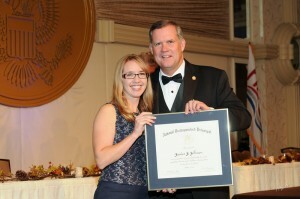 NAESP President Mark White presenting the National Distinguished Principal award to Jessica. Jessica Johnson is an Elementary School Principal and District Assessment Coordinator in Wisconsin. She is the 2014 Wisconsin Elementary School Principal of the Year. She has previously taught in Minnesota, where she earned her bachelor of arts degree at Bemidji State University. She taught and worked as an instructional coach and assistant principal in Arizona, earning her master’s degree at Arizona State University. Jessica is also an adjunct professor in the Educational Leadership Department at Viterbo University. She is the co-author of several books: Balance Like a Pirate: Going Beyond Work-Life Balance to Ignite Passion and Thrive as an Educator (Burgess, 2018), The Coach Approach to School Leadership, Breaking Out of Isolation: Becoming a Connected School Leader and a childrens novel, Adventures in Blockworld: A Novel for the Young Minecraft Fans. She also co-hosts the #PrincipalPLN Podcast. You can follow Jessica on Twitter as @PrincipalJ or contact her at jessica@principalj.net. Note: The views expressed on this website are solely of my opinion and not the views of my employer.